One of the truest luxuries is creating the bedroom of your dreams. Even with minimal space & a limited budget, you can easily make this one a reality. Add a bench to the end of your bed! There are some great low cost options. Refresh your linen and bedding! Get some luxe tips here. Add flowers for both fragrance and beauty! Get tips from none other than Martha Stewart on the art of arranging flowers. Most of all enjoy the season with your windows open and enjoy the fresh air to celebrate summer! Pots made of breathable fabric are an exciting new development in container gardening. They offer several advantages over conventional plastic or terracotta pots. If you are planning to grow plants on your balcony or patio this year, here’s what you need to know. Fabric pots are shaped like a traditional flowerpot, but they’re sewn from a sturdy non-woven material similar to landscaping cloth. Companies such as Smart Pots and Root Pouch manufacture them from BPA-free plastics. Some styles include handles for ease of rearranging your garden. The pots are available in a variety of colors, in sizes ranging from 1 gallon to 200 gallons. They are typically reusable for two or more seasons, and can easily be collapsed for storage. One benefit of fabric pots is their influence on root development. While a conventional hard-sided pot causes roots to circle the perimeter and become root-bound, a fabric pot has the effect of air pruning. When roots encounter the porous material, the root tips are pinched off so that they stop growing laterally. Instead, they begin to produce masses of fibrous smaller roots, which enable the plant to more efficiently absorb water and nutrients from the soil. Fabric pots also allow for better airflow and drainage so that roots don’t become waterlogged. A 2005 study conducted by Texas A&M University found that plants in fabric pots did not require more water than plants in plastic pots, and yet the soil in fabric pots was comparatively more cool and moist. This means that fabric pots can protect your plants from shock due to roots getting overheated in direct sunlight. 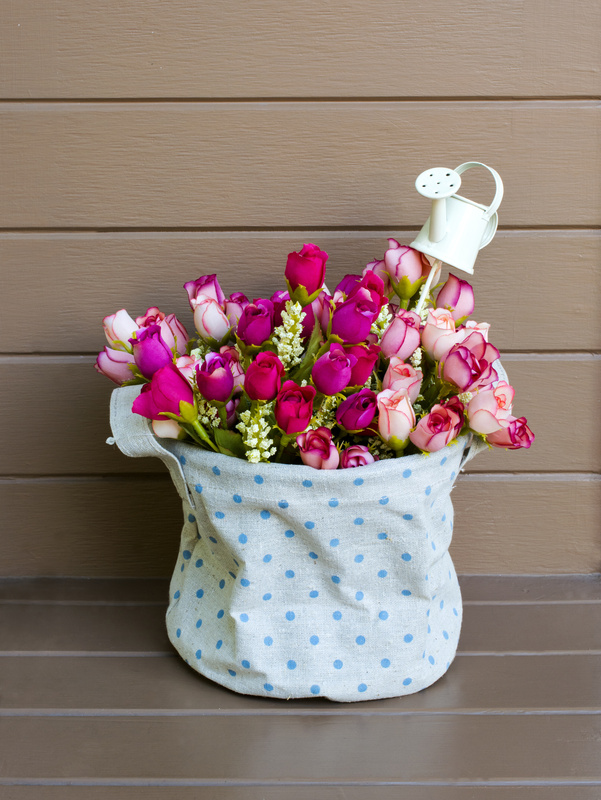 The same study also found that rose bushes grown in fabric pots produced larger flowers than their plastic-potted counterparts. Whether you grow your garden in permanent containers or start seeds indoors for spring transplanting, fabric pots can benefit your plants. They are versatile for use in a hydroponics setup, a patio garden, or even in your living room with waterproof saucers underneath. The many benefits of fabric pots make them an exciting new option for container-gardening enthusiasts.